← There’s Such Thing as a Picture-Perfect Wedding?! We all know that a cluttered desk equals a cluttered mind. No employee can be productive when important documents have gone missing, pens are lost, and thing are just scattered everywhere! Here are some quick and easy tips to tidy up the office for your employees to finally have a clutter-free mind with a neat desk to match! 1. Don’t let important documents fly away! You’d think that just because you’re indoors, papers won’t go missing. Keep them neat and in place with paperweights. Paperweights don’t have to be random boring blocks. Use beautiful crystal ones like the Color Coated Gem Cut Slant Dome Paperweight or the Clear Duet Round Paperweight that can be personalized with your company logo and even your employee’s name. Whether it’s flashy or classy, finding an attractive paperweight that your employees enjoy will definitely keep your papers and documents in one place and always lookin’ good while maintain your corporate identity! 2. Never have pens going missing again! Oftentimes, we find ourselves replacing our pens because we lose them to the point where we don’t have any pens left! This simplest and best solution is a pen set. With pen sets like the Beveled Glass Gold Pen Set or the Crystal Single Silver Pen Set, you can engrave your company logo and your employee’s name to guarantee their pens won’t go missing again! 3. Don’t let heavy books fall over! Keep all important books, business catalogs, and magazines secure and in one place with a bookend. Nothing is worse than having books topple over your desk, making a mess that shouldn’t have been created in the first place. With the Executive Bookend Award as a gift to your employees, this great office accessory will keep their books in place while maintaining a professional workplace! 4. Be prepared and organized for networking! It is a given that in any company, you will need to network and engage in professional encounters. Give your employees neat Crystal Business Card Holders to keep all of your company business cards in place and ready to be shared. Maintain your corporate identity by engraving your company logo on this accessory to always leave a great impression on your potential clients that visit the office! Cleaning up your office space doesn’t have to be a drag! 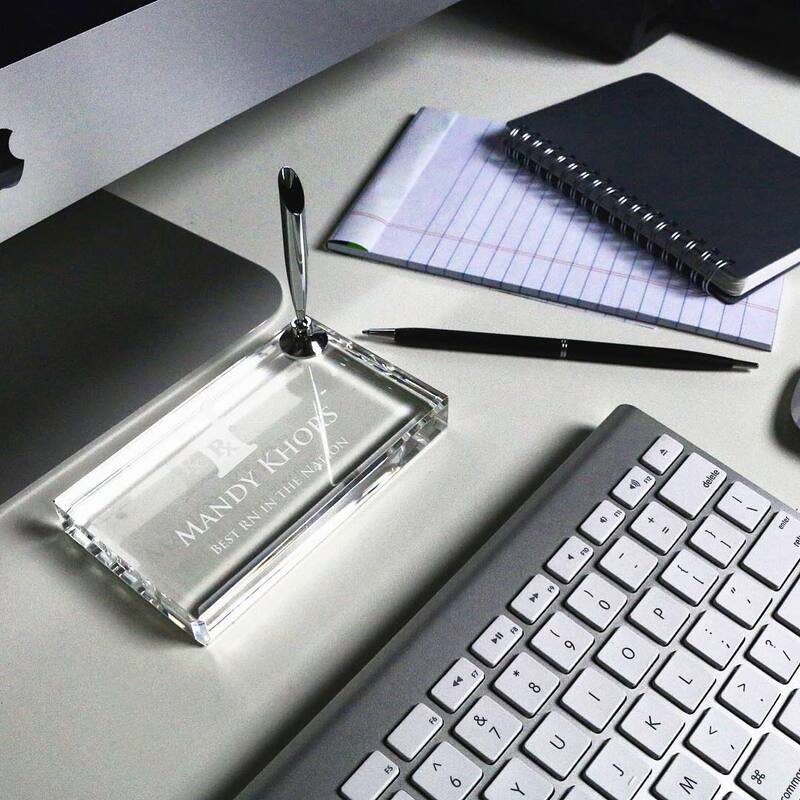 The great thing about using these office essentials from Crystal Plus is that it organizes your desk in style and allows you personalize it with special logos, artworks, and texts. Nothing beats a neat and attractive desk. So get creative with the office and personalize it with these easy steps to finally achieve a productive workforce for your company and for all!